The witch puppet sculpture by Amy Cousins towers over University Galleries curator Jason Judd. The title of Cousins' show is spelled out in furry letters, combining playfulness with an activist cry. A board full of LGBTQ flyers is a throwback to collegiate message boards. Fuzzy rope stantions stand outside of a curtained off club where a dance party runs continuously within. And inside the curtained area, a fuzzy disco ball rotates as dance music plays and videos runs. A detail of Amy Cousins' work. 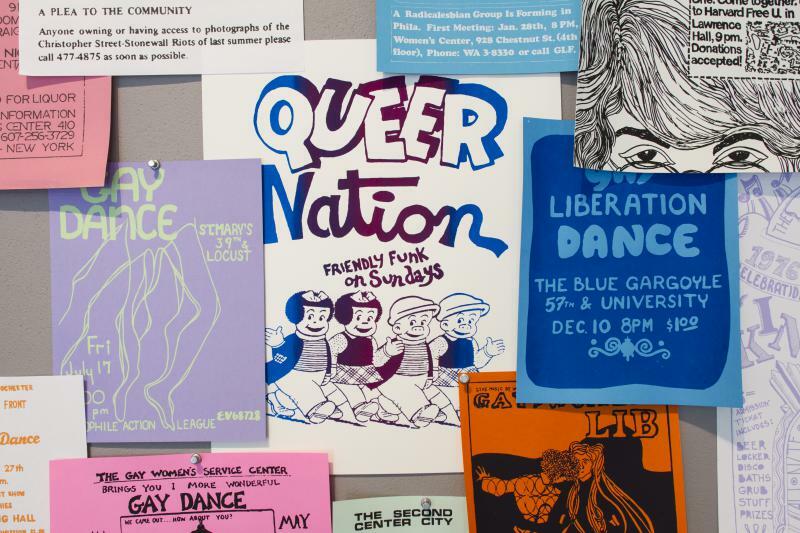 Amy Cousins is delivering an artist lecture on Oct. 5 at noon and hosting a queer dance party on Oct. 7 at 9 p.m. at the University Galleries. 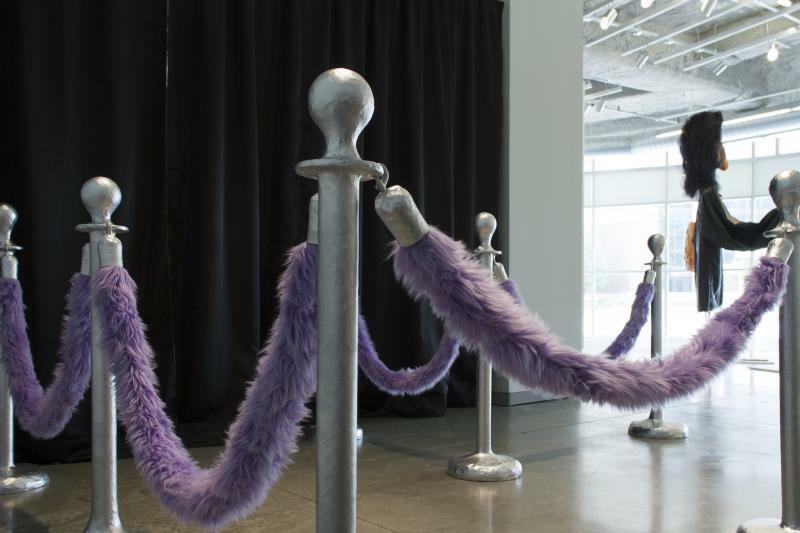 A gigantic witch puppet—both imposing and comical—dominates a new exhibition at the Illinois State University that uses playfulness to explore activism and protest. Past and present activism runs through the latest works from Philadelphia-based artist Amy Cousins. 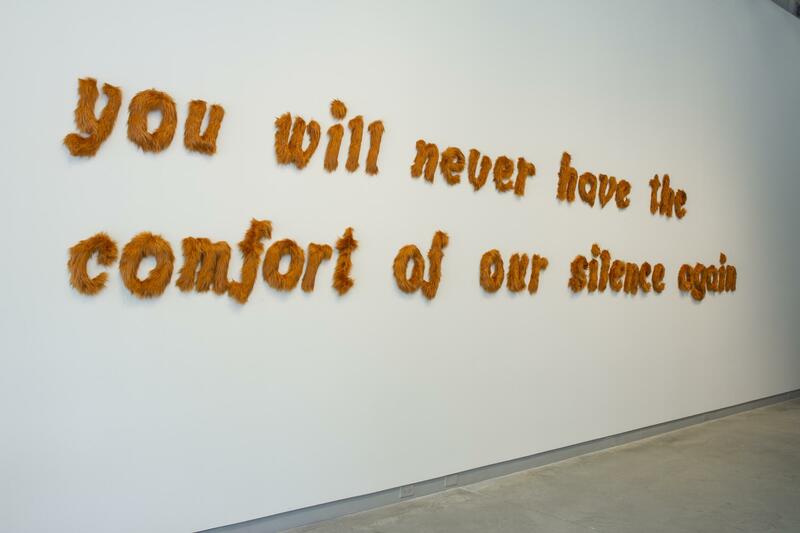 Her show, "You Will Never Have the Comfort of Our Silence Again," is currently up through Oct. 8 at the University Galleries in Uptown Normal. Cousins' work springs from rare protest ephemera and out-of-print feminist newspapers. In creating her new exhibition, Cousins looked within, but she also looked to the past and deep into archival material. "I spent a lot of time digging around in archives in the William Way Community Center, an LGBT center in Philadelphia," Cousins explained. "And they have some really amazing things. I started looking at gay newspapers and radical newspapers that circulated during the gay liberation era of the 70s. 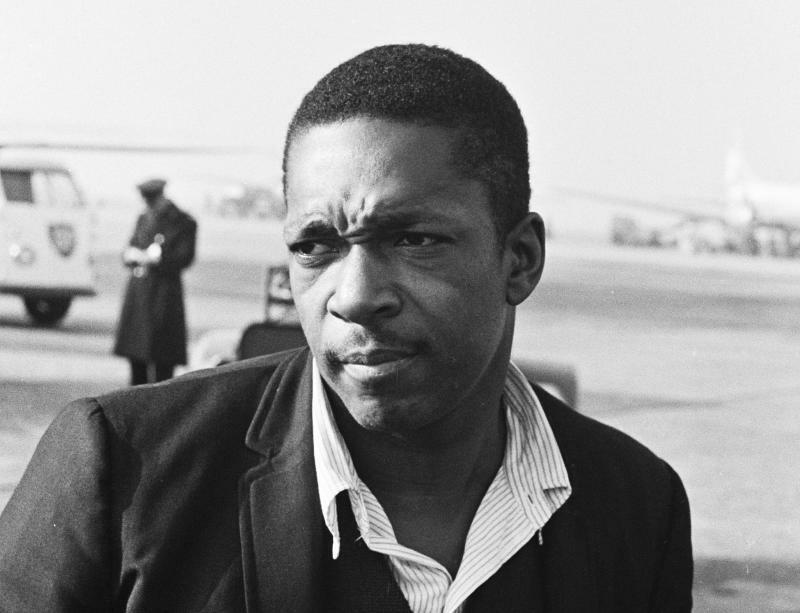 I found some really exciting stuff and went from there." Where Cousins went from that initial inspiration resulted in a large-scale sculpture of a witch puppet, that runs a little over 10 feet tall and has an impressive arm span, as well. The organization DYKETACTICS! was an activist group in the 70s that originally wielded a witch puppet to protest the death of an equal rights bill. The activists carried a banned that declared "You Will Never Have the Comfort of Our Silence Again" and had the witch cackle statements such as "I am the lesbian tapped inside every woman." Although no photos of the puppet exist, Cousins used contemporary descriptions to create her own. "I was struck by the playfulness and the boldness of this statement in the face of some real authoritarian violence at this protest. So I was fascinated by the witch puppet, and that lead me to create her in my own mind and what she stood for, spinning that stereotype of the lesbian witch spinster character and making her this goddess and queer monument. There's a subversive playfulness and there's also an implied teamwork and interaction. My puppet would need three people to carry it. That's all embedded in the form and the material." 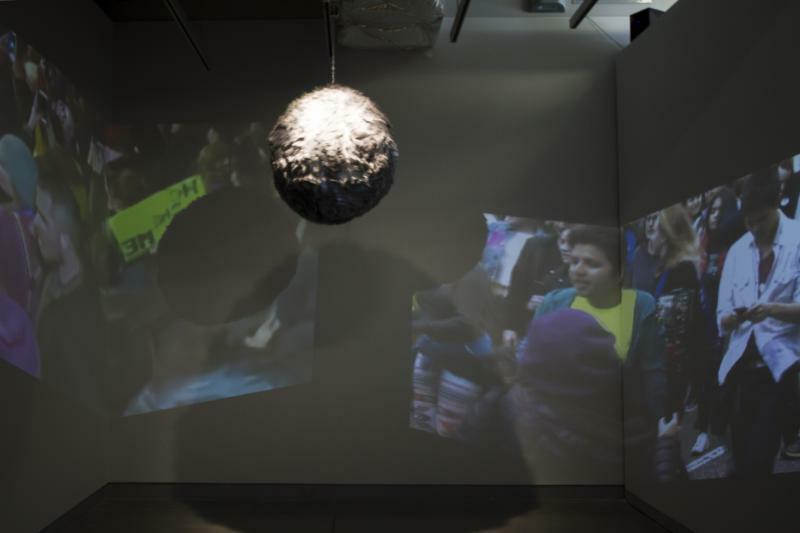 In addition to her installations in the gallery, Cousins' exhibition includes a queer dance party, which she will host at the gallery on Saturday, Oct. 7, from 9-11 p.m. Cousins is scheduled to deliver an artist lecture at the gallery on Thursday, Oct. 5, at noon. The latest exhibition in the Joe McCauley Gallery at Heartland Community College features works by an artists whose brand is Romance, and who believes that art and beauty have the power to evoke change. A section of the University Galleries is aglow with the latest works of Dennis French.